New Patients Receive 15% OFF Complete Pair of Eyeglasses. (Can Not Be Combined With Insurance Benefits). Sign-up using the form or call us at 508-444-8691 to take advantage of this exclusive offer. Call us at 508-444-8691 today. Welcome to Advanced Eyecare Specialists, PC. located on Main Street in Falmouth, Massachusetts. Our practice opened in the Fall of 2009 by Dr. Timothy J. Sajban, OD. Our office uses the latest technology with electronic medical records. Our examinations employ the latest in computer assisted comprehensive eye examination with auto refraction, corneal topography, automated Visual Fields, and digital retinal imaging while maintaining a focus on individual vision needs and diverse lifestyles of our valued patients. Advanced Eyecare Specialists is a full service eye and vision care provider and will take both eye emergencies as well as scheduled appointments. 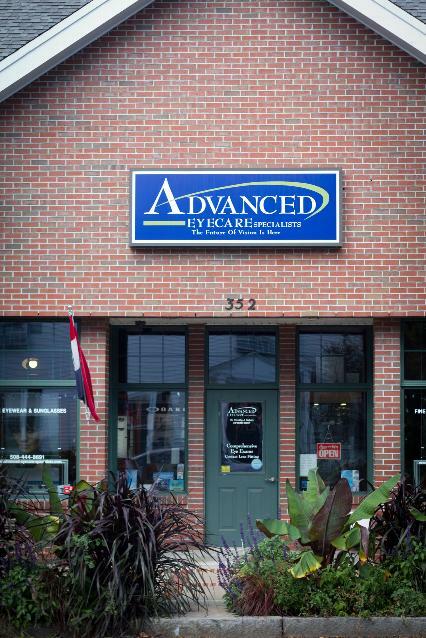 Patients throughout the Falmouth area come to Advanced Eyecare Specialists because they know they will receive the personal attention and professional care that is our foundation. Dr. Sajban and our team are dedicated to keeping our patients comfortable and well-informed at all times. At Advanced Eyecare Specialists, we will explain every exam and procedure and answer all of our patient's questions. Additionally, at Advanced Eyecare Specialists, we accept all major credit cards, health savings accounts, and will work with vision insurance providers to ensure good eye health and vision care for all of our patients. Our one-on-one approach to optometry makes Dr. Sajban and the Advanced Eyecare Specialists staff the eye and vision care providers of choice in the Falmouth area. Our Falmouth office offers the following services: complete eye exams, contact lenses, plano and prescription sunglasses and glasses, glaucoma testing, and pre- and post-operative care. For a complete list of services, visit our services page or call our Falmouth office at 508-444-8691. At Advanced Eyecare Specialists, we are dedicated to providing high-quality optometry services in a comfortable environment. Call us at 508-444-8691 or schedule an appointment today online. "Advanced Eyecare Specialists is the best at what they do and make you feel right at home."